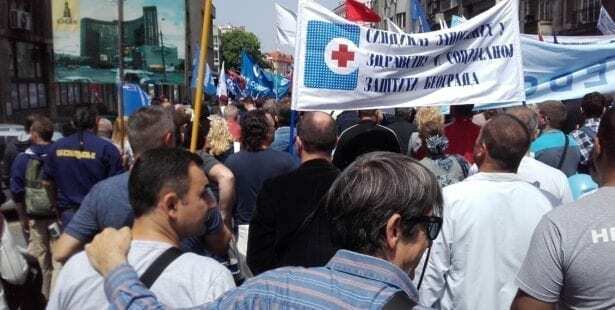 Serbians celebrate May Day 2017. In Serbia, the Solidarity Center works to build the capacity of its union partners to pass and enforce workplace safety and health standards at the national, regional and municipal levels. Solidarity Center assisted development of a national network of trade union activists to coordinate union activities and improve the quality of of workplace safety and health monitoring. The network is improving the database of information unions use in their advocacy for improved working conditions. Serbia’s transitional economy includes private corporations and state-owned enterprises in areas such as utilities, telecommunications, and natural gas. Many Serbian unions have made significant efforts to improve workplace safety and health conditions and, partnering with the Solidarity Center, they are actively shaping development of a holistic legal framework for occupational safety and health. Unions are looking to use collective bargaining to expand occupational safety and health protections for all workers, including those who are not union members. Serbian unions are developing provincial occupational safety and health committees that coordinate and communicate information across parts of Serbia with the intent of improving safety at work in non-unionized workplaces. Such efforts improve workplace conditions and increase worker awareness of the role of trade unions in ensuring worker rights. Trade unions use the local and regional programs to strengthen interactions with government agencies, occupational physicians and civil society groups involved in improving environmental conditions in local communities. A strong, democratic and inclusive union movement is central to ensuring that all workers are represented in building the democratic processes of the country, and the Solidarity Center supports Serbian unions in their efforts to broaden the influence of their issue campaigns.